This is the third in a series originally published on Parksify of brief spatial ethnographies intended to provide a snapshot of one public space, for one day, in Portland, Oregon. Armed with a camera and a watchful eye, I observe the social behavior in relation to the built environment. The profiles are based on research methods used in my masters thesis in Urban Studies and are inspired by the works of William H. Whyte, Setha Low, and Jan Gehl. This Park Portrait is admittedly not about a permanent park, but a parklett that I helped create for a single day in downtown Portland. 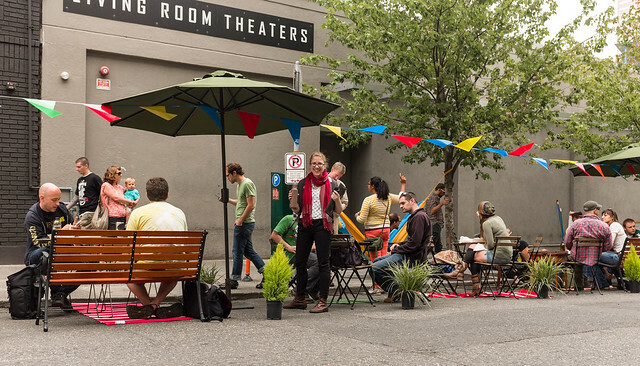 On September 20th, we took part in the PARK(ing) Day event with hundreds of other public space enthusiasts around the world. On an entire block of Southwest Stark Street we converted ten parking spaces into a greyspace plaza for a day. Our goal was to supplement the existing spaces and give the city a truly public space. The location was, we thought, an extremely ideal place for this kind of activity. A good public space needs the right kind of activity to fill those moving chairs and tables, and this stretch of Stark has an ideal mix of restaurants, coffee shops, a hotel, nearby food carts, and a recently opened pedestrian alleyway. Believe it or not, despite the many food cart pods scattered throughout Portland, very few come with respective seating areas. Even more than this, Portland as a city is lacking this kind of public space — a stretch of street devoted to the public, rather than parked cars. While one pedestrian street exists, it consists entirely of picnic tables for nearby businesses, and the Street Seats program is spread thin. Our goal was to supplement the existing spaces and give the city a truly public space aimed towards what is lacking generally but also to add to this neighborhood even if just for the day. The PARK(ing) Day Park itself consisted of about two former parking spaces of bicycle racks and about eight parking spaces of public seating. One space was more akin to a living room, a parking bench added a buffer to the nearby lane of traffic and complimented casual seating around a coffee table. About another five spaces had umbrellas and cafe tables and chairs scattered throughout for the public to use as they thought was best. Near the living room space a hammock also provided another option for relaxing on the street. The furniture was light and movable, and the scattered umbrellas presented the option of more, or less, shade. 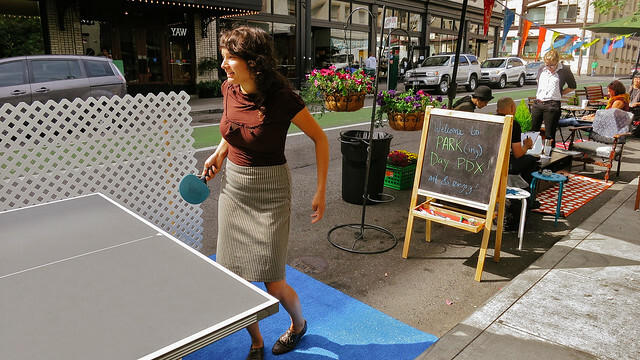 As an added component of programming, there were also two ping pong tables available for public play. After the set up at 10 AM, the street was slightly quiet, possibly due to the shock of chairs suddenly appearing in the street. Once things were settled, however, people started trickling in, whether for the ping pong or just for a place to sit outside and work. A coffee shop (without any outdoor seating) is very close by, and some found it convenient to simply bring their tea pots and coffee mugs across the street to sit outside for a bit. Before too long, the lunch crowd started moving in. While the ping pong tables were in constant rotation, the tables were filled to capacity. At one point, a man with a container from the nearby food carts came over and eagerly looked for a seat. When none was to be found he inquired as to if he had to take a number or if there was a system in place — thankfully a table immediately opened up and the man quickly filled the space. The rest of the afternoon was filled with children playing, strangers meeting over a friendly game, and quite a few passersby intrigued by the sudden activity on the street. The hammock was in constant use all day. The socializing, a complete success. Even passing cars slowed their speed due to the activity. As people moved in to restaurants for the dinner hour, the seats emptied out and the temporary parklett was brought to a close. Though not a permanent park, it was clear that one like this could work without issue. Movable chairs and tables are inexpensive and it wouldn’t take much to convert a few lanes into a plaza (Philadelphia did it with The Porch a year ago, to great success). 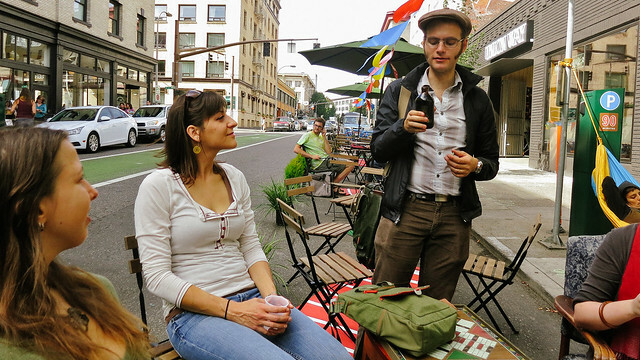 Portland has plazas, but only one major (popular) space downtown anywhere near food carts. 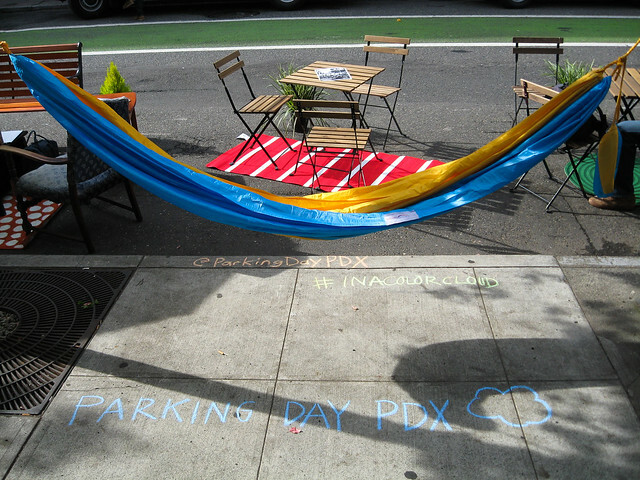 Maybe it’s time for a permanent PARK(ing) Day parklett? As public spaces go (and my biased opinion aside), this was definitely one of the liveliest I’ve seen in a while.